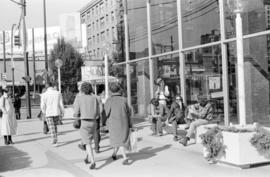 Item part is a photograph of a sidewalk scene outside the W. Georgia Street side of the Hudson's Bay Company building (674 Granville Street). 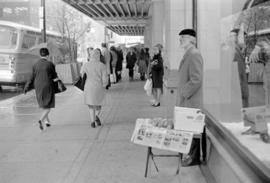 Art prints are out on the sidewalk and some pedestrians stop to look at them. 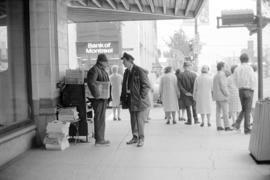 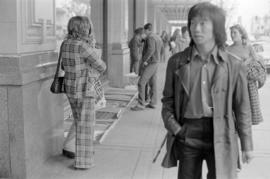 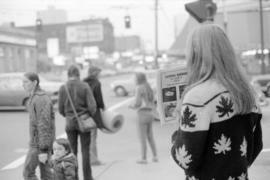 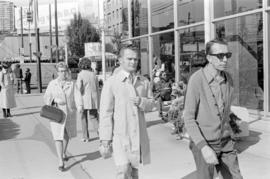 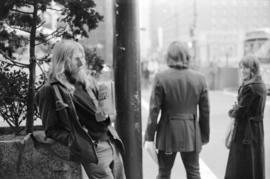 Item is a photograph of people on the sidewalk on the Robson Street side of the Vancouver Public Library (750 Burrard Street). 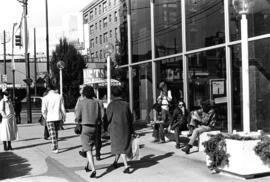 Item part is a photograph of people on the sidewalk on the Robson Street side of the Vancouver Public Library (750 Burrard Street). 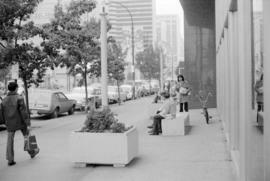 Item part is a photograph of people on the sidewalk on the Robson Street side of the Vancouver Public Library (750 Burrard St). 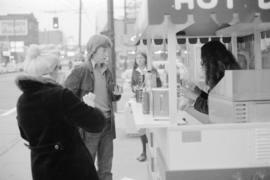 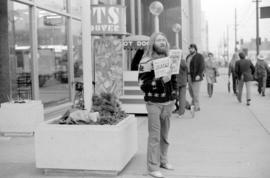 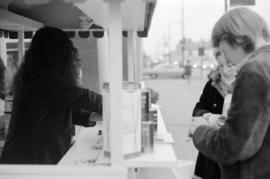 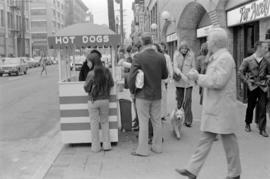 Item part is a photograph of a man at a hotdog stand and people on the sidewalk on the Robson Street side of the Vancouver Public Library (750 Burrard Street). 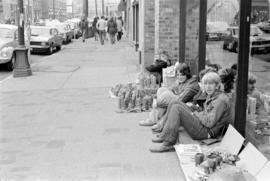 Item part is a photograph of street vendors sitting on the sidewalk outside of The Coggery (130 Water Street). 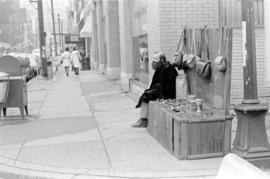 Item part is a photograph of a sidewalk scene on Water Street, looking west. 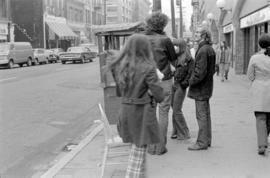 Pedestrians walk along the sidewalk past the Colonial Hotel (122 Water Street) and The Coggery (130 Water Street). 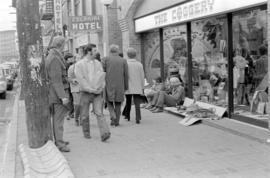 Street vendors sit on the sidewalk outside The Coggery. 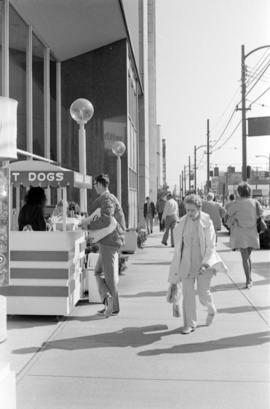 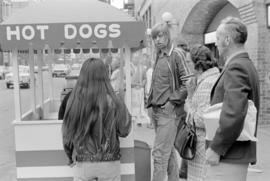 Item part is a photograph of pedestrians and customers of a hot dog stand outside of Far Away Places (134 Water Street), the view is looking west down Water Street. 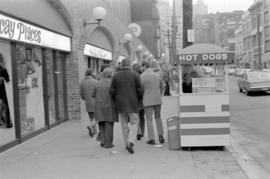 Item part is a photograph of pedestrians and customers of a hot dog stand outside of Far Away Places (134 Water Street), the view is looking east down Water Street. 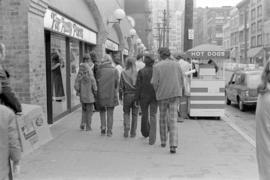 Item part is a photograph of pedestrians on the sidewalk and clustered around a street vendor outside Railway World (150 Water Street), the view is looking east down Water Street.